We'd noticed the radiator and coolant pipes were getting very hot even after just a minute or two of running. This was likely down to the thermostat being seized. As the thermostat acts as a valve to allow coolant to flow from the engine to the radiator, with it jammed closed the engine would just get hotter and hotter. This was a much easier job than i thought it would be. 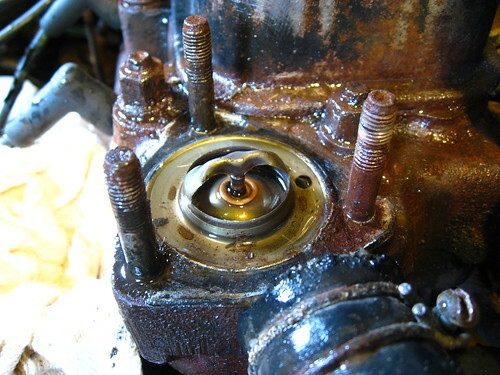 The thermostat is under a housing (fig 2) at the radiator end of the engine block under a steel housing which also accommodates the filler cap. The three nuts securing the housing came off relatively easily, though the housing itself took a few taps with a hammer to loosen - you'll want to drain the system of water a little by removing the top radiator hose or you'll have water all over the engine bay. It's also worth putting a rag over the alternator as you'll most likely get some water coming off as you work. Remove as much of the old gasket as you can before getting the old thermostat out as it'll be much easier to lift then. Our thermostat had a small hole in the top which allowed us to insert a small screwdriver to lift it out. Once out we cleaned around the three bolts, making sure all traces of the old gasket were removed to ensure the new one had a good fit. We also took the opportunity to give the old housing a good brush up too. The new thermostat (see fig 3, new on left old on right) went back in followed by the new gasket and the housing. Refilling the water confirmed the valve had been jammed closed as it took much more water than we'd drained during the job and the car now runs a whole lot cooler. In all a job well worth doing for less than a fiver's cost in spares.